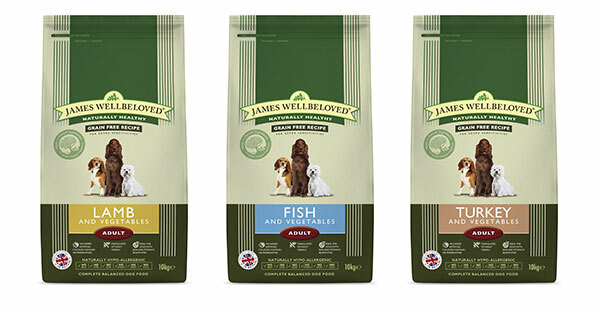 Ideal for the maintenance of adult dogs, the James Wellbeloved Adult range is carefully formulated to meet protein and energy requirements and also includes a balanced combination of soluble and insoluble fibres to support the digestive system and to promote firm stools. The addition of yucca extract helps to reduce stool odour,whilst added omega-3 fats promote a healthy, glossy coat. Chicory inulin, a natural pre-biotic, is also included in the formulations to encourage beneficial bacteria in the gut. 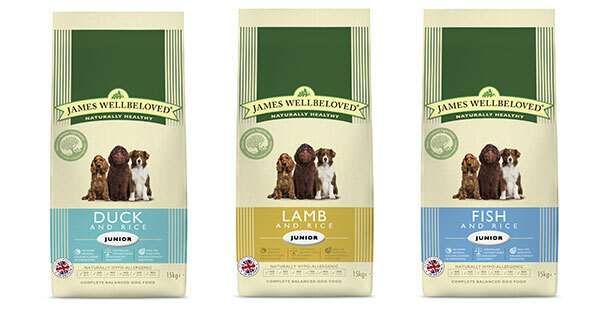 The James Wellbeloved Senior range is ideal for dogs over 7 years of age, and is tailored to the older dog’s specific nutritional requirements. The JW+joint support complex of glucosamine, chondroitin and herbs is added to support older joints,which may become stiffer with age. Taurine is added to support the heart,with extra vitamins C & E to support the immune system. James Wellbeloved Kitten is formulated to meet the increased protein and energy requirements of the rapidly growing kitten and to fully support bone development. A natural prebiotic - chicory extract - is added to support digestive health, as well as extra taurine - an essential amino acid which supports many fuctions, including eyes and heart. Omega fatty acids promote a glossy coat and Yucca extract is included to reduce stool odour. A complete dry food with the bonus that it is hypo-allergenic. With selected protein sources (turkey or fish), it is a dietetic food, excellent for the reduction of ingredient and nutrient intolerances. 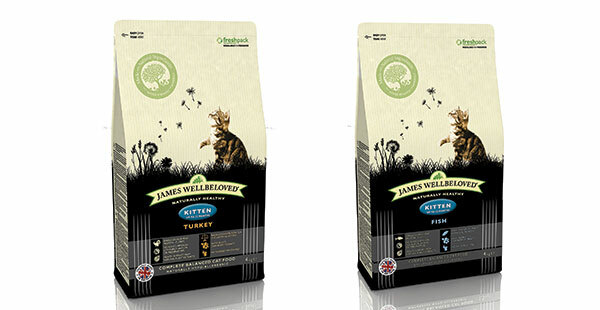 James Wellbeloved Wet Pouches for Kittens is a complete dietetic wet feed with the bonus that it is hypo-allergenic. With selected protein source (turkey or lamb) and selected carbohydrate sources (potato and cassava) it is a dietetic food, excellent for the reduction of ingredient and nutrient intolerences. 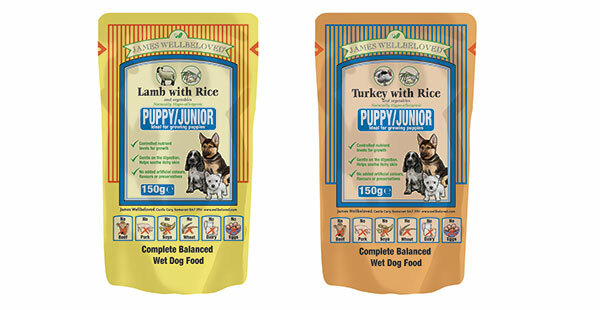 The James Wellbeloved Puppy range has been expertly designed and formulated to provide your puppy with a naturally healthy and nutritionally balanced diet, which is gentle on his developing digestion. 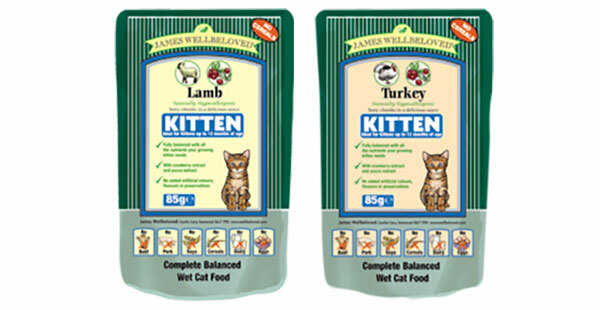 Suitable for feeding from six to eight weeks onwards, the complete formulas contain higher levels of protein and fat to support the rapid growth phase, combined with calcium and phosphorus in the correct amounts to support optimum bone development. The kibble is of a smaller size to suit smaller mouths. 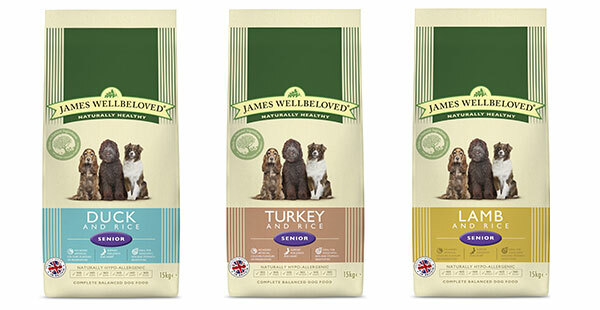 Made to the same exacting standards as Jame Wellbeloved dry food. This means that you can be sure that you are feeding your dog a food which is both tasty and healthy. Only using a single source of meat protein with easily digested rice and vegetables to reduce the risk of food intolerances. The pouches contain no added artificial colours, flavours or preservatives, no beef, no pork, no wheat or wheat gluten,no dairy products, no egg and no soya. The pouches are easy to open, in a handy size ensuring a fresh meal every time. The pouches can be fed on their own or as a tasty topper for dry food. 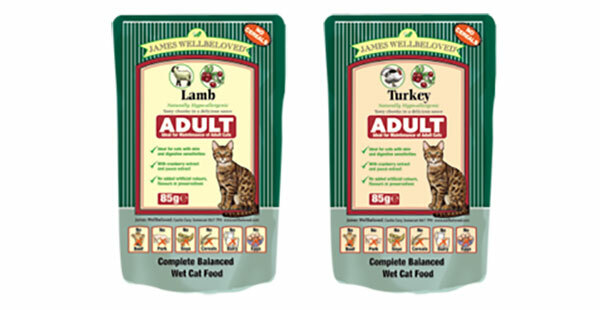 James Wellbeloved Adult is formulated to meet the protein and energy requirements of the adult cat aged 1 to 7 and includes a balance of soluble and insoluble fibres to support the digestive system. Chicory extract which is a natural prebiotic is also added. Omega fatty acids promote a glossy coat and Yucca extract is included to reduce stool odour. 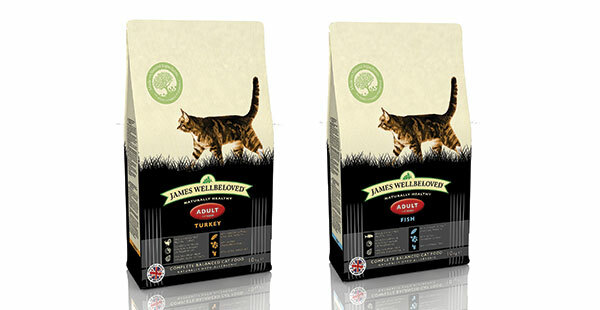 James Wellbeloved Wet Pouches for Adult Cats is a complete dietetic wet feed with the bonus that it is hypo-allergenic. With selected protein source (turkey or lamb) and selected carbohydrate sources (potato and cassava) it is a dietetic food, excellent for the reduction of ingredient and nutrient intolerences. 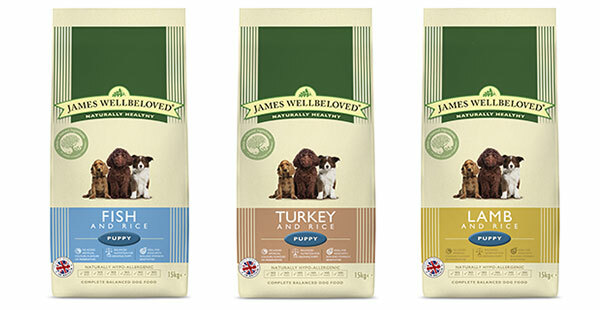 The James Wellbeloved Junior range can be fed from around six months of age - standard Junior is suitable for dogs with an adult weight of between 10kg and 25kg. Dogs of this weight range will reach maturity at around 10 to 12 months. The Junior range is formulated with balanced levels of fat and protein to ensure a steady, healthy rate of growth to help your dog reach the correct adult weight and body condition. The junior kibble is larger than puppy kibble to suit this second phase of growth. 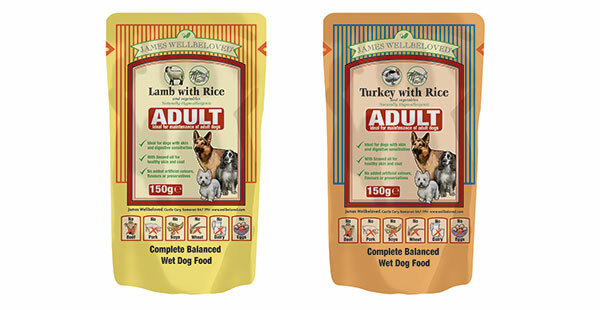 Made to the same exacting standards as James Wellbeloved dry food. This means that you can be sure that you are feeding your dog a food which is both tasty and healthy. Only using a single source of meat protein with easily digested rice and vegetables to reduce the risk of food intolerances. The pouches contain no added artificial colours, flavours or preservatives, no beef, no pork, no wheat or wheat gluten,no dairy products, no egg and no soya. The pouches are easy to open, in a handy size ensuring a fresh meal every time. Can be fed on their own or as a tasty topper for dry food. 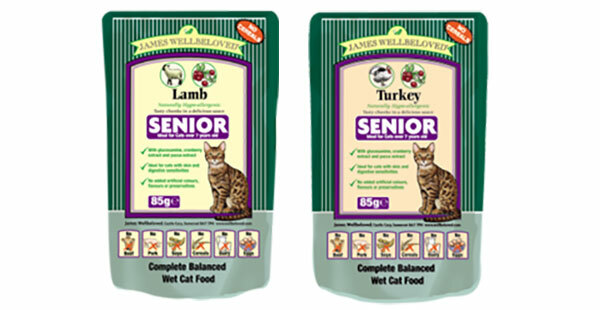 James Wellbeloved Fish Senior is formulated to meet the protein and energy requirements of the adult cat of seven years and older. Included is a mix of glucosamine, chodroitin and herbs to support the joint system which may become stiffer with increasing age and the phosphorus level is restricted to reduce the risk of renal problems. Like the adult food, the recipe includes a balance of soluble and insoluble fibres plus natural prebiotic to support the digestive system and Yucca extract to reduce stool odour. James Wellbeloved Wet Pouches for Senior Cats is a complete dietetic wet feed with the bonus that it is hypo-allergenic. With selected protein source (turkey or lamb) and selected carbohydrate sources (potato and cassava) it is a dietetic food, excellent for the reduction of ingredient and nutrient intolerences.